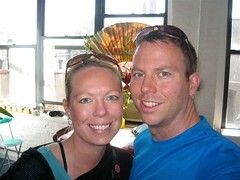 Jesse and Yvonne took Manhattan with elegance and efficiency. Wrapped in comfortable but stylish travel attire, they covered most of the city in just four short days. Their packed schedule meant we missed the opportunity to take their portrait, so they snapped a quick one for us in the kitchen on their last morning.